Environmental decision support systems (DSS) that provide a real-time fish and water management tool to decision makers are a proven means to improve the balance of water management decisions affecting both human and natural systems (Hyatt et al. 2015). 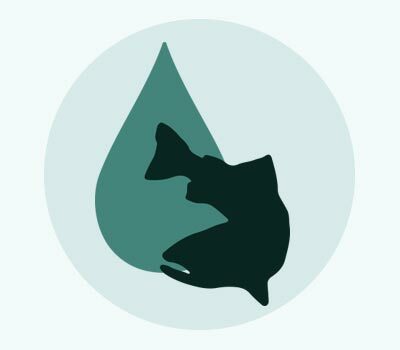 The Nicola Water Management Tool (NWMT) is a DSS that provides a risk assessment framework to integrate biophysical processes, deal with multiple species and geographic locations, anticipate socioeconomic outcomes of water management decisions, and increase cooperation among water users to improve fish and water management. Furthermore, providing a common base of assumptions, the tool can be used as a powerful new communication aid for stakeholder learning and outreach purposes. For example, when additional water releases are needed for fish migration, the tool can be used to communicate these needs to downstream water users who would be encouraged to reduce withdrawals. 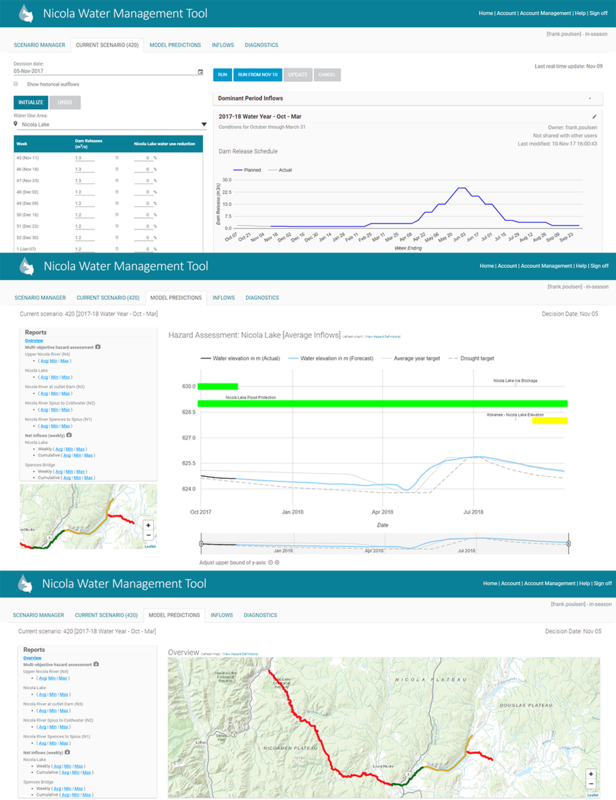 The Nicola Water Management Tool is a web-based DSS for real time operations of weekly release schedules for the Nicola Lake Dam. It automates complex biophysical calculations and provides a highly intuitive set of visualizations of outcomes for a range of key performance indicators. Starting with weekly net inflow forecasts from the water supply and hydrology submodel, the tool will determine the in-lake and downstream consequences of these releases in terms of predicted flows at key index locations The synthesis of data provided by the NWMT will also provide a simple method for these same water users to see the flow and ecosystem effects. The tool will also provide managers with an easy way to track decisions, why they were made and what information was available at the time, e.g., the River Forecast Center (RFC) inflow forecast. The Nicola Water Management Tool also incorporates a water use submodel that allows users to simulate the impact of voluntary water use cut-backs on streamflow. Water use is currently limited to agricultural water use only, which is estimated using the Agriculture Water Demand Model (AWDM) developed by the BC Ministry of Agriculture and Agriculture and Agri-Food Canada. For the purpose of the NWMT, the AWDM was used to estimate the weekly irrigation demands of different crops, soil textures, irrigation systems and climatic conditions over a 30-year historical time-series for 8 distinct spatial regions. Water managers can simulate the impact on streamflow by prescribing a weekly voluntary restriction on water use for each region and assumed water need for current year, either as a statistical measure (i.e. high, average or low water use) or using a specific historical year. The water use model assumes that all the water saved by the water reductions are retained in the rivers and thus increase the expected streamflow in the river by the same amount as water saved by the cutbacks. In addition to streamflow predictions, the NWMT also simulates water temperature for the Nicola rRver between Spius Creek and the city of Spences Bridge. The water temperature submodel relies on 14 day ensemble air temperature forecasts for the city of Merritt updated daily by Environment Canada. The water temperatures are estimated by applying a regression between air temperature and the previous day’s water temperature developed from historical observations of air and water temperatures. The water temperature submodel is designed to inform biologist of potentially harmful temperatures to salmonids, not as a management tool because the Nicola Dam has little or no impact on water temperatures downstream of Spius Creek. The dam can, however, be used to release a pulse of water to aid salmonid migration and the pulse can timed to coincide with when water temperatures are least likely to inhibit migration. Hyatt, K.D., C.A. Alexander, and M.M. Stockwell. 2015. A decision support system for improving “fish friendly” flow compliance in the regulated Okanagan Lake and River System of British Columbia. Canadian Water Resources Journal 40(1): 87-110. President | Practice Area – Environmental Water Mgnt. Contact us if you have any questions or would like to discuss the NWMT.